Norway has agreed to hand back thousands of artefacts removed from Easter Island by the explorer Thor Heyerdahl during his trans-Pacific raft expeditions in the 1950s. An agreement was signed by representatives of the Kon-Tiki Museum and officials of Chile’s culture ministry at a ceremony in the Chilean capital, Santiago, on Thursday as part of a state visit by Norway’s King Harald V and Queen Sonja. The objects include carved artefacts and human bones from the Rapa Nui, the first inhabitants of the remote Pacific island, which today is part of Chile. Consuelo Valdes, Chilean culture minister said the deal was part of a “comprehensive agenda” that included ensuring the safeguarding of the artefacts upon their return. “We have the mission to respond to the just demand of the Rapa Nui people to recover their cultural heritage,” Valdes said in a statement. The name Rapa Nui refers to the indigenous people of Easter Island, their language and the island itself. While warning that the repatriation process would take some time, Martin Biehl, director of the Kon-Tiki museum said it was in the common interest to return the items and ensure they are delivered to a “well-equipped” museum. According to Chile’s culture ministry, the items will be rehoused in the Father Sebastian Englert Anthropological Museum on Easter Island. Heyerdahl’s family said he had long wanted to return the pieces he collected on expedition in the mid-1950s and mid-1980s, which are currently on display at the Kon-Tiki museum in Norway’s capital, Oslo. The signing ceremony at Chile’s National Library was attended by Thor Heyerdahl Jr, who accompanied his father on one of his expeditions to Easter Island in 1955, when he was 17 years old. “The repatriation is a fulfilment of my father’s promise to the Rapa Nui authorities, that the objects would be returned after they had been analysed and published,” he said. Heyerdahl, an anthropologist, became famous in 1947 when he and a crew of five crossed much of the Pacific Ocean on a balsawood raft, the Kon-Tiki. He was seeking to prove his theory that the Polynesian islands could have been settled by prehistoric South American people and not by settlers from Asia as most scholars believed. He died in 2002. “The study of remains – using DNA – could demonstrate a prehistoric contact between Rapa Nui and South America, which was the main thesis of my father,” Thor Heyerdahl Jr said. Authorities on Easter Island have long been calling for the return of artefacts from Norway and the UK. 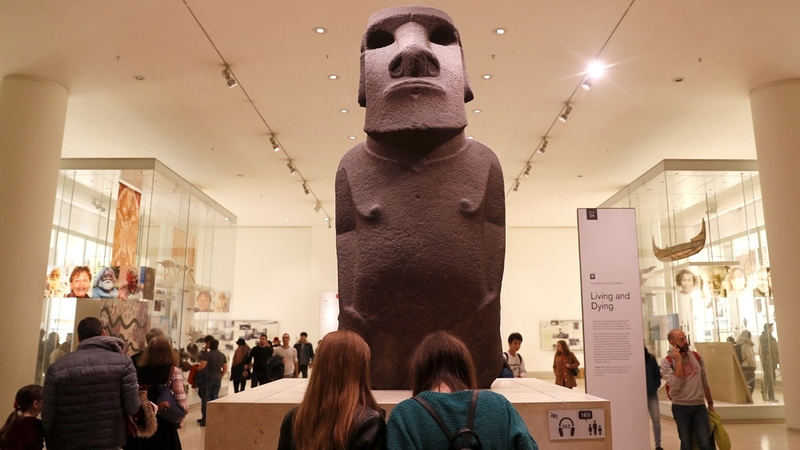 They are also demanding that the British government return Hoa Hakananai’a, a monolithic stone statue known as a moai, from the British Museum in London. The moai was taken from the island in 1868 by the captain of a British frigate and presented to Queen Victoria.